We have all seen The Terminator wreaking havoc but saving the day in the end; practically a machine sacrificing its electronic life once the work is done. Machines tend to do that often now with such technological advancements up in our sleeves. Founded by Dr. Andrew Ng, Landing AI is a firm that develops tools of machine vision that finds microscopic defects in the products; defects that cannot be found by human eye. They create an algorithm that has so far yielded amazing results. A lot of times we come across images that have text on them. The only way to access that text is to write it down yourself; however, Microsoft released Computer Vision API that extracts and transforms text on images to a text that one can easily access and edit. A lot of pharma companies are under strict regulations to make sure that their product can be tracked from the line of production until it reaches the customer/patient. Several companies put GTIN code to the product through which the company can track down the product. But how do you read that tiny code that has all the information? A German company came up with a solution that includes high machine vision cameras and optical recognition to read the text. A UK based company NVIDA came up with a ‘cloud to edge’ technology that improves efficiency and safety of the construction and mining equipment. Video analytics and real-time cameras make work more efficient and also predicts that whether the movement to be made by the equipment is safe or not. The human eye is pretty basic when it comes to manufacturing equipment with important microscopic details. A machine vision device high-resolution images to create the equipment model. The machine takes multiple images from different angles and then puts them together to identify where the pins should be connected. Running a production line is an important job and you would not want any defected product to cause problems resulting in huge losses. WebSpector, a machine vision system, was developed by a company named Shelton that detects defects in products, classifying them according to the kind of defect the product has. Any company that depends on components has to make sure that their equipment and machinery is up-to-date and is maintained regularly. Machine vision has made it a lot easier by identifying when an equipment needs maintenance often through sensors. 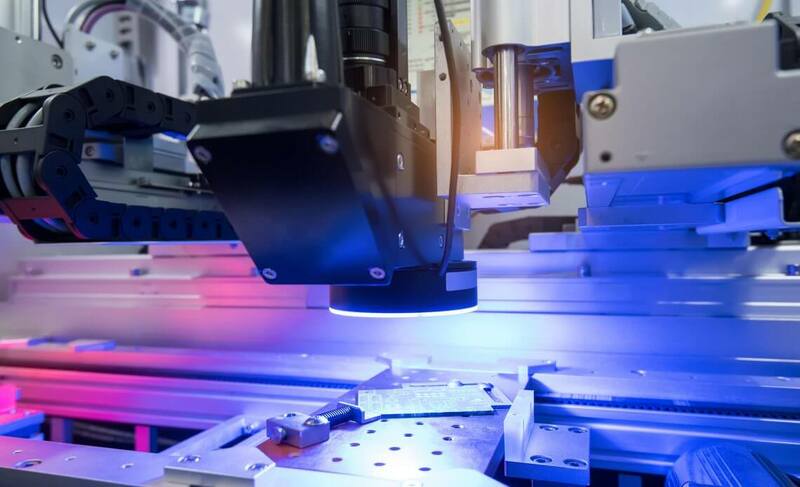 Zero Down Time (ZDT), made by FANUC takes pictures and then sends them, along with metadata to, the cloud for identifying any problems that might arise in the machine. Machine Vision is what is going to save companies from huge losses. The ability to predict and identify issues with the equipment is what every business now needs for safety measures and a successful production process.